CASE #1 – Oh no! 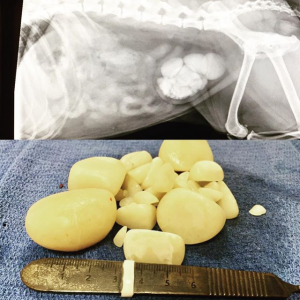 Bladder Stones! Here is our patient Daisey Mae, who had to undergo surgery for bladder stones. We could not believe our eyes when we found 45 stones which we removed from her urinary bladder!! 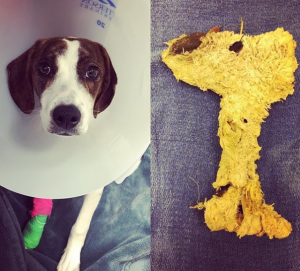 Daisey Mae did wonderful throughout surgery and has been feeling much better without those stones in her bladder! Meet our patient, Millie she came in for a foreign body surgery. It just so happened that Millie had eaten “Woodstock” the fictional character from the Charlie Brown movie! She was feeling much better once the foreign body was removed & made a full recovery! 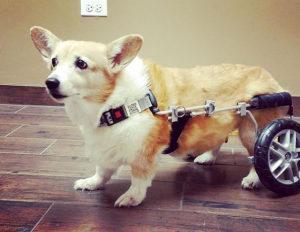 Sweet Mocha got fitted for her wheels at Oswego Animal Hospital with their rehabilitation department. 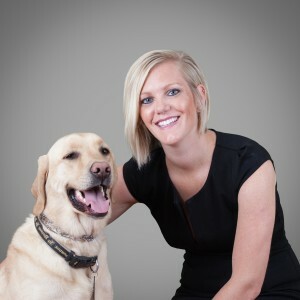 Unfortunately, Mocha was diagnosed with degenerative Myelopathy last year. We look forward to watching her experience her new “mode of transportation”. Mocha has been doing very well adjusting. Loki presented with a fish hook stuck in the corner of his mouth. Fish hooks can be tricky to remove due to the prongs and have to be pushed through rather than pulled back. 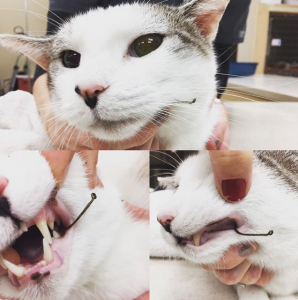 Loki was sedated and the hook was removed by pushing through his cheek. He recovered well! CASE #5 – The Largest Bone in the Whole Body! 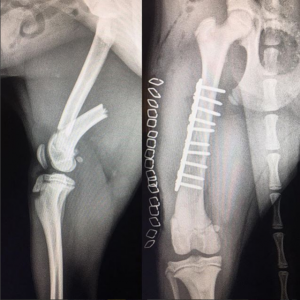 Leia fractured her femur, the largest bone in her body. She had it repaired with a plate and screws. We hope she’s back on all 4 legs very soon! 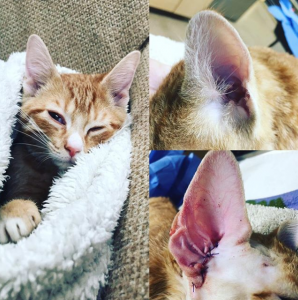 Benny, a 5 month old kitten, had a benign polyp in his middle ear giving him a significant head tilt when walking. He had a procedure called a TECA BO (total ear canal ablation and bulla osteotomy) to remove the affected part of his ear. He gets to keep his pinna “ear flap” and is on the road to recovery. Morris is had to be hospitalized for a urinary tract obstruction. This condition, where the urethra becomes inflamed and sand like material found within the bladder moves and obstructs the urethra, tends to be more common in middle aged neutered male, overweight cats. 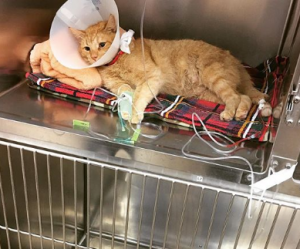 Morris was sedated and a urinary catheter was placed. It will remain in place for a few days to allow inflammation to subside and medications and special diet to take effect. Morris made a full recovery! CASE #8 – What’s Under That Microscope? Interesting cytology of the day…. 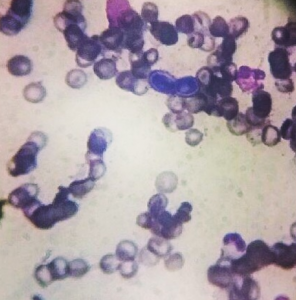 Blastomycosis (the bright blue budding yeast toward the center top of the viewing field) found on a slide made from a draining tract wound on a dog’s toe. Maddison presented to have a small mass on her upper eyelid removed. 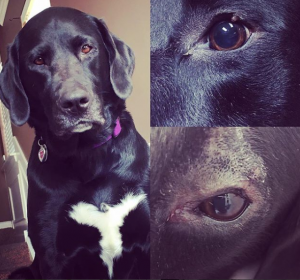 Most of these eyelid tumors are benign (non cancerous) but can rub and cause irritation to her cornea. She has two very small stitches in her eyelid and should heal great! 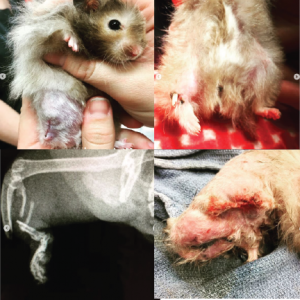 Forest is a 1 year old male Teddy Bear hamster that presented for an open fracture of his right tibia/fibula. His leg was amputated and he’s healing really well!